Nachos seem simple enough (chips + cheese + ALL THE OTHER THINGS), but beneath that simplicity lie certain, more complex strategies. And cheese and chips and stuff. 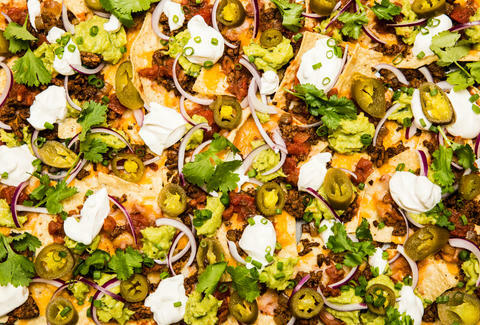 But there's a science behind the perfect platter, and it starts with toppings evenly dispersed onto each chip, which should be big and sturdy enough to hold up to the weight of the toppings. The trick is to spread them out instead of stacking them up, so each chip gets a hit of beans, meat, and cheese. Just don’t overdo it: some chip should still be visible underneath all those layers, ‘cause you'll need something to grab onto. Heat oil in a large heavy skillet over medium-high heat; cook onions until translucent. Add beef and cook, breaking it up with a wooden spoon, until evenly browned. Drain excess fat. Add chili seasoning and cook for 1 minute. Add salt and pepper to taste. Remove from heat and set aside. 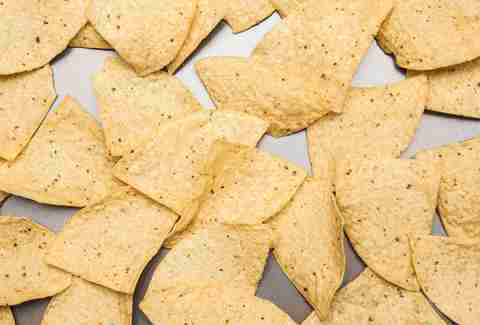 Spread chips out in an even layer on two rimmed baking sheets. Smear 1/2 teaspoon bean dip in the center of each chip. Sprinkle evenly with cheeses. Bake until cheese is bubbling and melted and the edges of chips are just starting to brown, 8 to 10 minutes. Remove from oven and top with beef, salsa, guacamole, red onion, sour cream, jalapeños, cilantro, and scallions. Serve immediately.